Moss watertube solid fuel packaged boilers provide large radiant and convection sections for conservative steam supply for your process. Our watertube boiler offerings range in size from 250 - 1,500 HP (51,750 Lbs./Hr.) with design pressures from 250 - 950 PSIG. These boilers can also be provided with superheat for high temperature applications. Large radiant zones promotes lower particulate, CO and NOx emissions, while promoting combustion chamber refractory longevity. The convection zone of our boilers are provided with special alloy baffling that is designed to scrub gases efficiently and producing steam quickly. 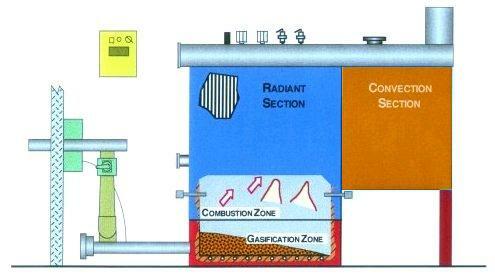 The combustion and radiant zones provides the proper amounts of air, temperature and retention time to burn off the gases efficiently at designed temperatures promoting clean emissions and prompt steam response. This proven system design has been used for years in all types of solid fuel burning industrial applications and can be used with a Moss gasifier or fluidized bed combustion system or Detroit Stoker vibrating (VCC) or hydro grate combustion system. Moss also provides cross drum (CD) module type field erected watertube boilers in sizes from 50,000 to 125,000 lbs./hr. (comes with modular tube panels allowing for minimum installation at the jobsite) and field erected units up to 250,000 lbs./hr. These units have design pressures from 250 - 950 PSIG at saturated or superheated temperatures up to 950° F. Our CD design boilers are generally supplied with fluidized bed or Detroit Stoker combustion systems (please see in combustion chamber section of website) for burning various fuels. Our large conservative radiant zone allows complete combustion of the fuels with an approximate heat release of less than 25,000 BTU/cu. ft. This allows for lower particulate, CO and NOx emissions in order to meet the most stringent emission requirements.